ABOUT US ship your boxes sea freight forwarding air freight forwarding moving? order container vehicle transport boat shipping road and intermodal forwarding special cargo rate requests cargo tracking document center smart links references customers worldwide other moving from hungary GALERY usa purchase assistance? Other than containerized shipping we can also offer you RO - RO service! If time is of the essence when shipping your vehicle and you don't want to wait for containers to being loaded. 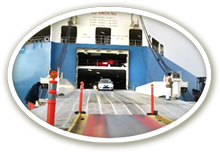 Your vehicle can be shipped from almost all US main ports. This service is able to save you money on long distance transportation, also shipping and loading costs compared to containerized shipping. Roll on - Roll off service is connected with all major ports you find on the world map. With Roll on - Roll off shipping you can ship the following cargoes without any size limit. Regardless of using own power, towable or moving with a use of special equipment's. Note: All automobile manufacturers are transporting their new cars with Ro-Ro service. We can offer weekly service to ship your vehicles. This service also available between all worldwide seaports !! Please click below link to download and complete your vehicle rate request.